In case you didn’t get the memo, Ben Affleck and Kevin James are taking over the world. Since they both have new movies opening on October 12 (Argo and Here Comes the Boom, respectively), they’ve graced the couches of every talk show out there, and James even woke up bright and early to talk sports with Mike & Mike on ESPN’s morning show (James is an ardent Jets and Mets fan, despite their struggles in the standings). And that’s precisely why audiences are so drawn to James. With a knack for gut-busting observational humor and a guy-next-door charm, he’s been a natural at playing the lovable underdog both in leading and supporting roles. Whether he was busting a move for Will Smith in a way that was, let’s just say, memorable for all the wrong reasons in Hitch, cruising on a Segway to fight crime in the ‘burbs in Paul Blart: Mall Cop or getting a little help from his furry friends to win over the love of his life in Zookeeper, he owned every scene with his patented schlubby charm. 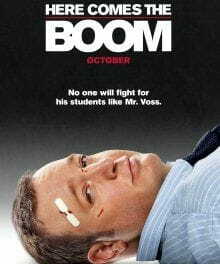 Now with the aforementioned Here Comes the Boom, James plays a 42-year-old biology teacher named Scott Voss who’s not exactly enjoying his job anymore. Like many schools these days, there’s a shortage of money and therefore, inspiration, from disgruntled employees, and before long, a series of cutbacks threaten to cancel the music program and all extra-curricular activities. Worse yet, the music teacher’s job is also in jeopardy, which is a serious blow to Scott since he admires the way Marty Streb (Henry Winkler, a.k.a. The Fonz) connects with students. As grim as the situation seems at his school, Scott decides he has do something, anything, to help save these programs. Eschewing the usual bake sales and charity car washes, Scott comes up with a rather unorthodox plan while watching cage-fighting with his buddies. After discovering you can make $10,000 just for losing, Scott decides that’s the solution. When asked what was more of an acting stretch, playing a disinterested biology teacher or a newly trim cage-fighter, James admits that physically, cage-fighting was the worst. “It was brutal day in and day out,” James says with a laugh. But playing a teacher who could care less about his students was also a challenge because James realizes just how much of an impact a teacher can have, whether they’re a good egg or a particularly bad one. For James, faith and family are an integral part of his life, so it’s not surprising that he’s careful about what roles he chooses. Inspired by movies from a very early age, it was Rocky, not a funny flick that stayed with him the most. As for staying true to his faith in the movie business, James admits it isn’t always easy, and he never wants to come across as preachy. But in what he describes as a sea of “empty” movies flooding theaters these days, he’s definitely choosy and wants to be a good example. And whatever he’s doing, it’s always important to him to be part of something where audiences “can get away from the daily grind and walk away with something positive.” If that means playing more lovable underdogs? Well, he’s in. For more, check out Jeffrey Huston’s review of Here Comes the Boom on Crosswalk.com.